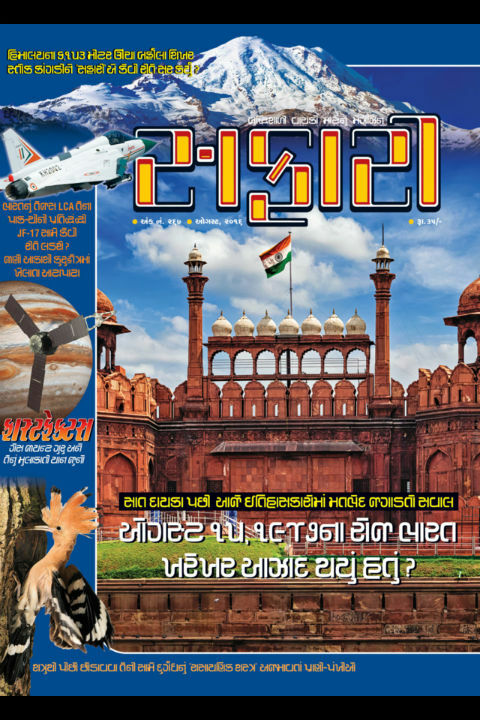 However we have received the August 2016 issue of Safari, a Science and Knowledge magazine from India (Gujarati Edition) quite on time, we didn’t get time to write a review for the same due to busy schedule. So here we go. It is worth to note that we have read the digital edition of the issue on Magzter app. The reading experience is not as smooth as it should be. However we got a very cheap deal to read a number of magazines for three months, making it worthy to go for. The cover page is having blue background showing Snowy Himalayas on the top an the famous Red Fort in the middle of the page. In the left hand side there are thumbnails for other prominent articles in the issue, making it attractive. In terms of design of the cover page you can give it more than 8 out of 10 points. The themed article of the issue is the travelogue of the editor Harshal Pushkarna where he visits Stok Kangri. It is worth to note that Stok Kangri’s elevation is 6,153 m (20,182 feet)! And it is the highest mountain in the Stok Range of the Himalayas in the Ladakh region of northwest India. And trekking to Stok Knagri is definitely one of the toughest Physical and Mental Challenge. The article is spread over 13 pages and it is written in fantastic manner. It is written in personal experience – blog – manner and gives you feeling of reading someone’s personal diary. It is very easy to read it from the comfort of office or drawing room. But making ourselves ready for such trek requires a lot of passion and hard work. You need to read this article to get an idea about how much our soldiers, who are stationed in even more extreme conditions does their duty to protect the motherland. Here are some links which will help you to know more about Stok Kangri. For any living creature on the earth, the most important aspect of life is to survive. That’s why the theory of survival of the fittest is appreciated unanimously. In order to perform these two extreme yet important taks, the nature blessed each of the species various abilities and powers. The creatures which are not as powerful as lion or tiger or elephant and not speedier to survive like deer, rabbit, cheetah and others; are blessed with some out-of-the-way tactics to survive. Some creatures can change their appearance to match in the background, while some can pretend to be dead. Some can use the way which often others find disgusting, to survive. There is an article in the magazine which talks about such tactics. The article talks about many creatures including Skunk. Skunk is famous for it’s spray. In some of the past issues of Safari magazine itself, there were articles about Skunk were published. The article talks about a bird named Fulmar. The article talks about many other species and is worth exploring on our own. The Fast Facts segment brings some nice information in summarized manner, making it small yet worth read. America uses Corn to produce Ethanol (Biofuel) while we are using Sugarcrain for the same purpose (like Brazil). What is better from both of these? How room freshener deals with odour or bad smell in room? As there are number of wastage pieces of satellites (any other stuff) are roaming in our orbit. What are the chances that one of them hit us? One more section of the magazine you cannot miss is Super Quiz section. It brings some amazing knowledge in Q/A format. I remember studying an article about Tejas an LCA (Light Combat Aircraft), to be included in Indian Airforce, many years ago; in an issue of Safari. Now as the prototype is ready and it is started commissioning; the article about the actual working model of Tejas in this issue of Safari is definitely a not-to-miss article. It discusses about the features of Tejas and even talks about the background of the project and it’s various aspects in interesting (to read) manner. A magazine issue which is definitely worth the time and money you spend for it. There are a very few magazines found in the market which offers so; so we recommend to go for it. NICE STUFF in Magazine.. all articles are good and informative.